Dr Matt Morgan, a local resident and intensive care specialist at UHW, joins us to launch his new book, Critical, on its publication date. 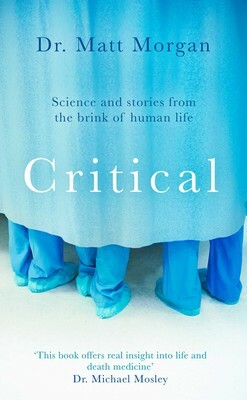 Critical is an intelligent, compelling and profoundly insightful journey into the world of intensive care medicine and the lives of people who have forever been changed by it. Being critically ill means one or more of your vital organs have failed - this could be your lungs, your heart, your kidneys, gut or even your brain. Starting with the first recognised case in which a little girl was saved by intensive care in 1952 in Copenhagen, Matt writes brilliantly about the fascinating history, practices and technology in this newest of all the major medical specialties. Matt guides us around the ICU by guiding us around the body and the different organs, and in this way, we learn not only the stories of many of the patients he's treated over the years, but also about the various functions of different parts of the body. He draws on his time spent with real patients, on the brink of death, and explains how he and his colleagues fight against the odds to help them live. Happily many of his cases have happy endings, but Matt also writes movingly about those cases which will always remain with him - the cases where the mysteries of the body proved too hard to solve, or diagnoses came too late or made no difference to the outcome. Ticket includes a drink on arrival and a chance to buy a personally signed copy of the book at a discounted price.